FREE SHIPPING. 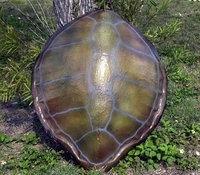 32" Green Turtle Shell Half Mount Replica. Having traveled the seas for over 100 million years, marine turtles have outlived almost all of the prehistoric animals with which they once shared the planet. Marine turtles survived the extinction of the dinosaurs and are still present in the world's oceans today. Three of the seven existing species are critically endangered with extinction. These are beautiful 32-inch fiberglass replica mounts of the shell from a green turtle. We can paint the turtle shell mount in many different ways to represent several realistic sea turtles. Estimated time for shipping is about 2-3 weeks.